The Little Match Girl, plus a GWP and Black Friday shades that nearly defy description. Hiya friends! 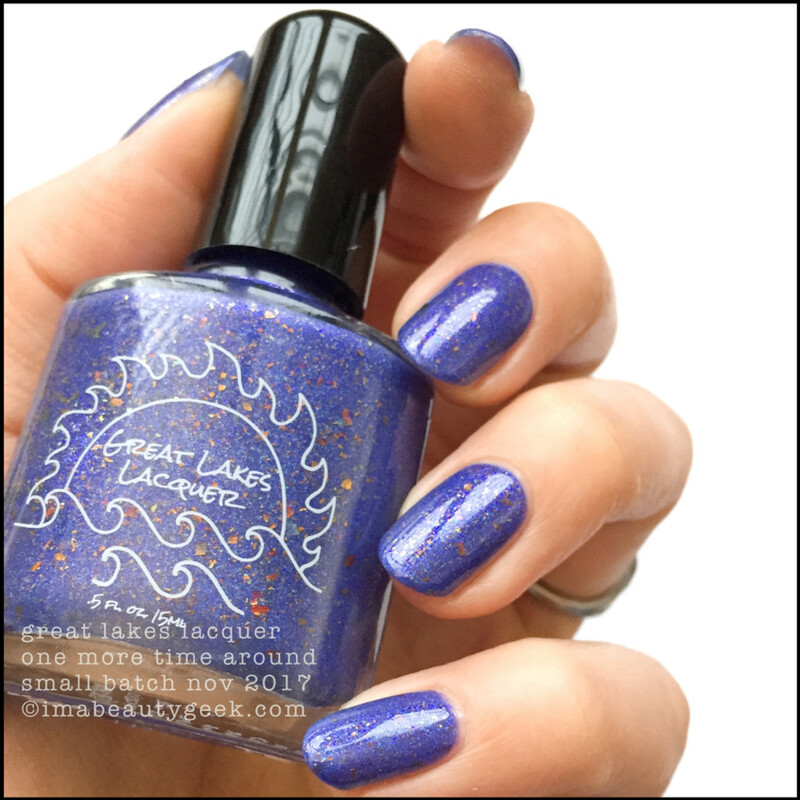 I gots some Great Lakes Lacquer swatches today! It’s a mix ‘n match of part Holiday 2017 with a coupla small-batch things that are set for Black Friday. I’ll say right now that if you’re a blurple fan, it’s your happy day. 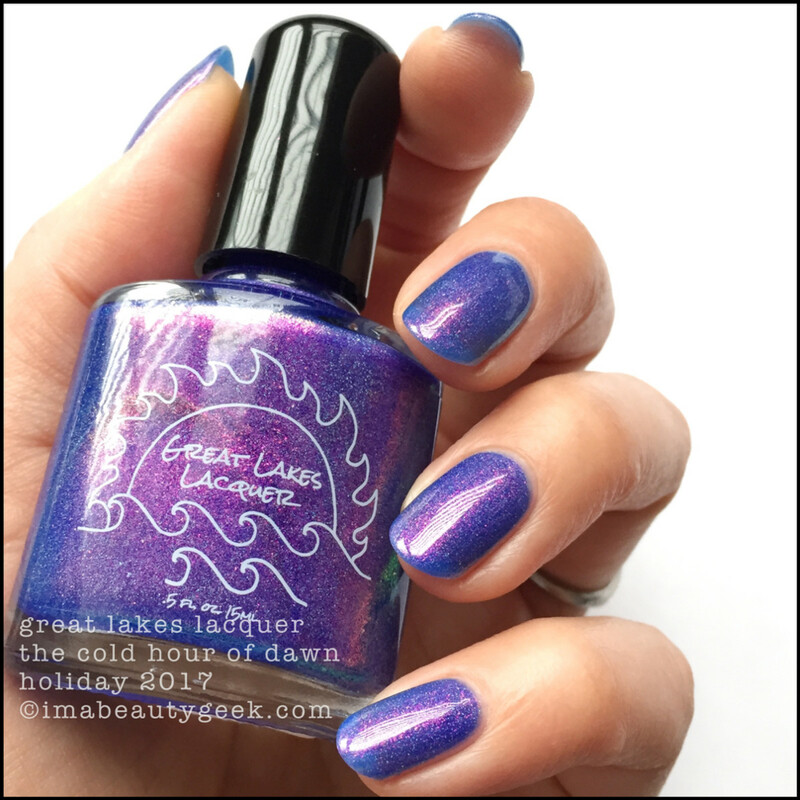 Great Lakes Lacquer In Brightness – Holiday 2017 (above). 2 coats + top. Do I need to say more? No, no I don’t. 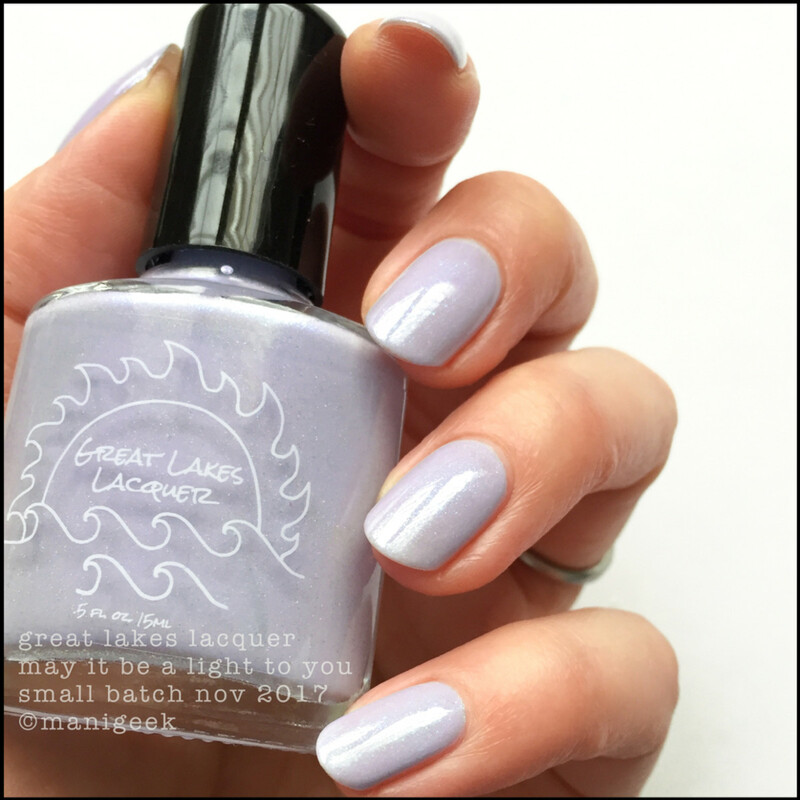 Great Lakes Lacquer in Brightness (above). Lookit how good she goes with a side of salad! Flabbergasting! 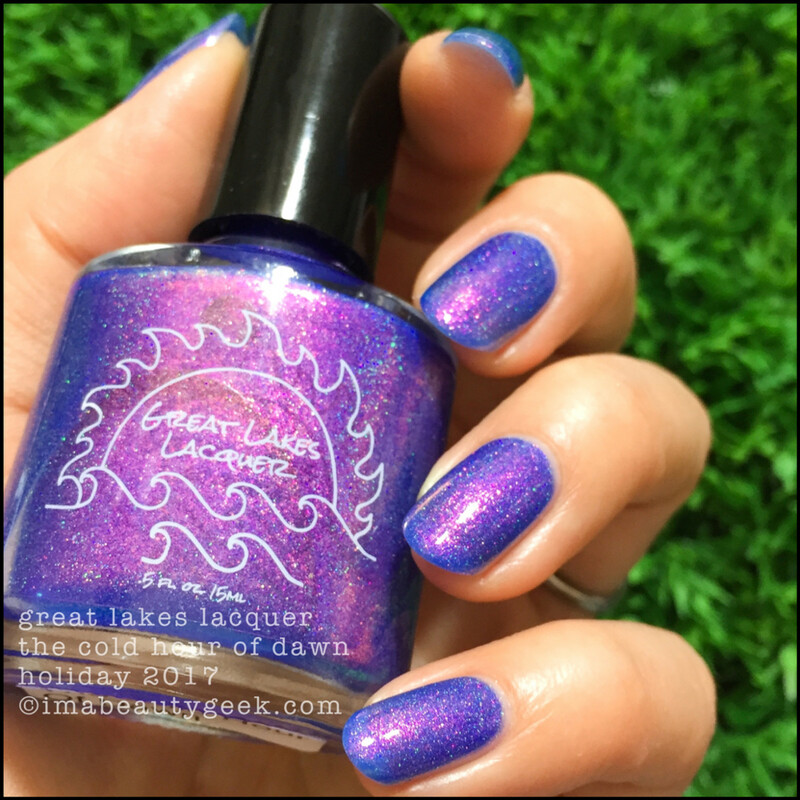 Great Lakes Lacquer The Cold Hour of Dawn (above). One more time just because it’s soooooo crazy good. 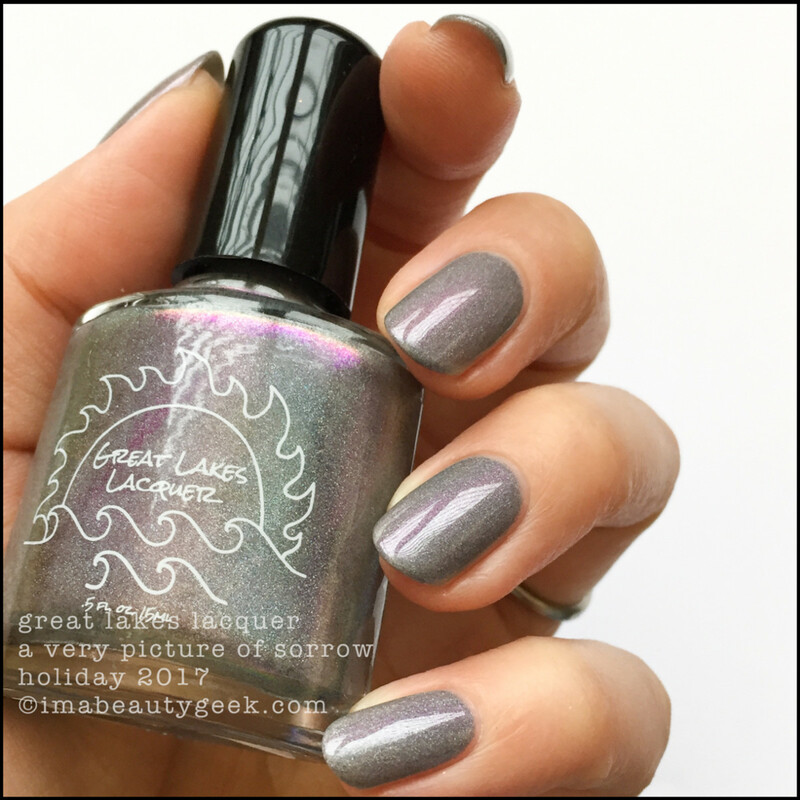 Great Lakes Lacquer A Very Picture of Sorrow – Holiday 2017 (above). 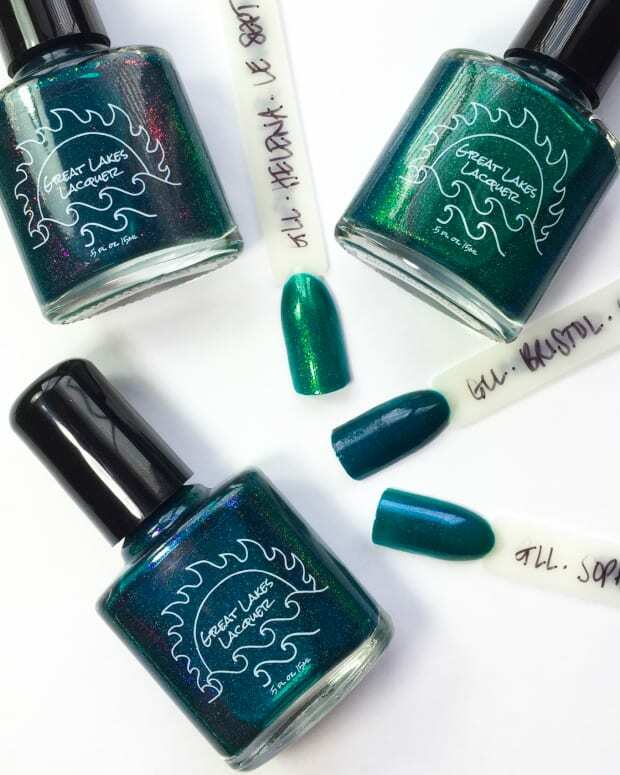 Yes, an even more odd name for a holiday polish, but Mariah’s Holiday 2017 collection is based on the beautifully sad Hans Christian Andersen short story The Little Match Girl. 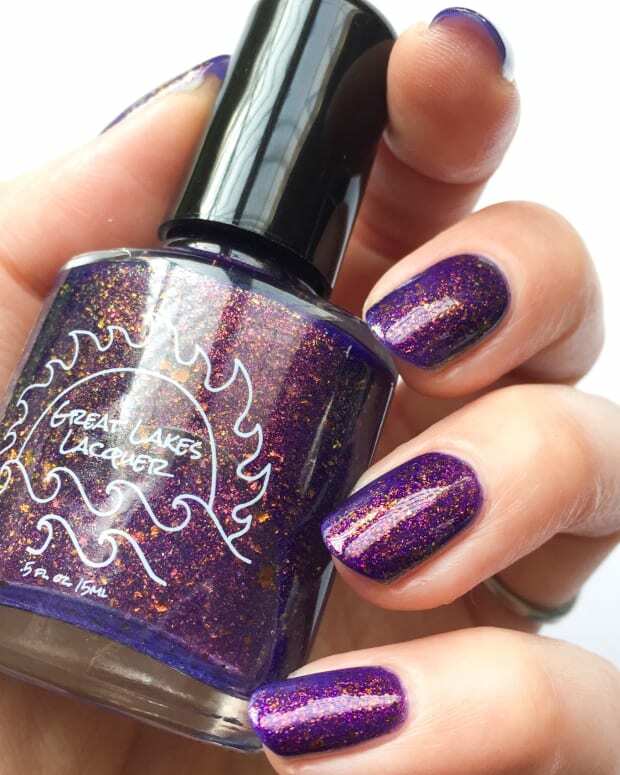 Great Lakes Lacquer A Very Picture of Sorrow (above). Kinda neat, huh? Where the light hits my nails, there’s a subtle thread of violet that runs through it that makes it look like a grey winter sky that’s getting ready to dump a whack of snow. It’s got mood, man. Like, mooood. 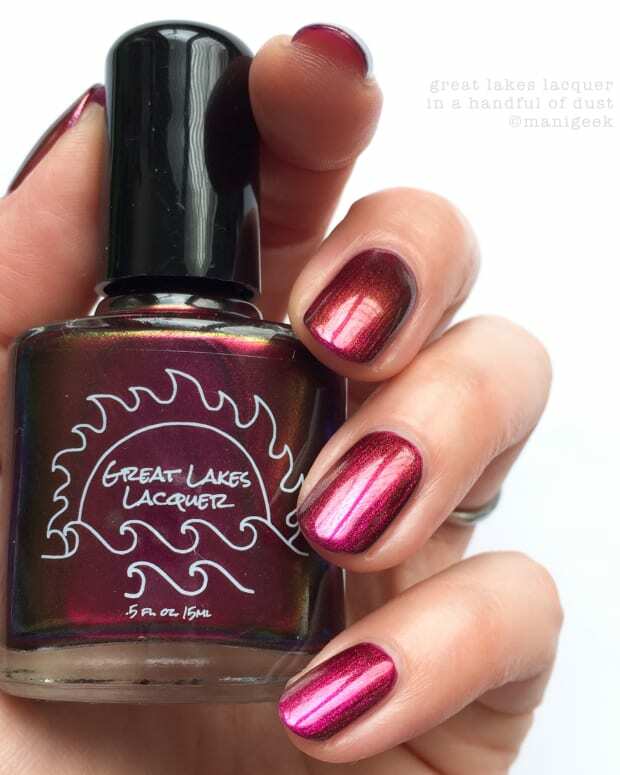 Great Lakes Lacquer A Very Picture of Sorrow (above). Wave her over some salad greens and she’s got rainbows! If you haven’t read the story, it’s not going to make sense to you. If you’ve read the story, your heart should&apos;ve just melted. 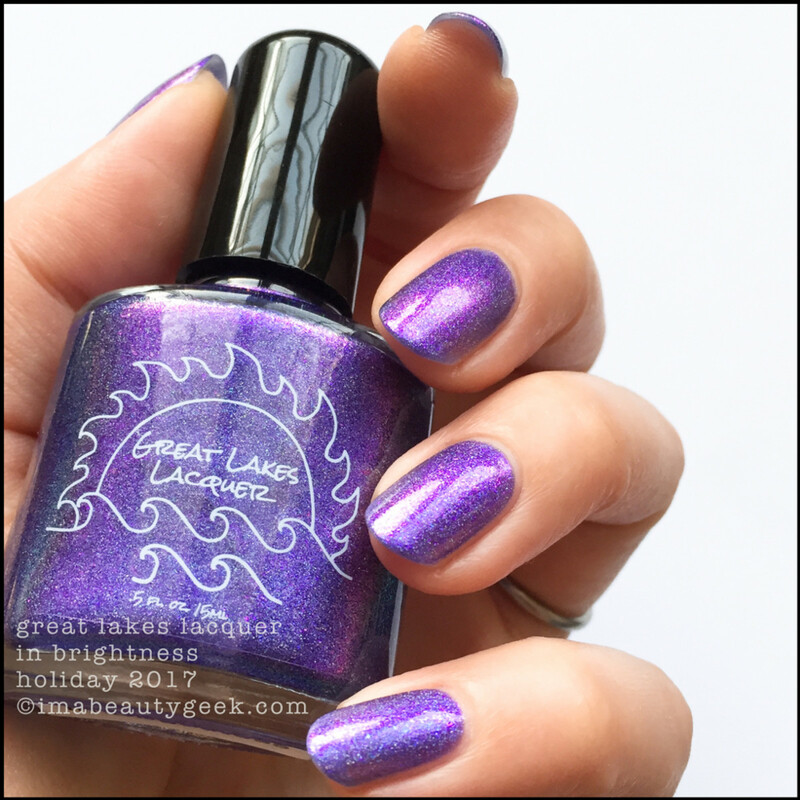 Great Lakes Lacquer Happy Holidays – Gift with $50 Purchase (above). You know how much I hate writing, yes? And it’s not because I’m not good at it because really, I’m okay at it. Writing for me is waaaay harder than talking because you can’t hear me ramble. For me, writing is a taxing mental exercise where I try to put words in a precise order so it conveys exactly what I’m trying to say while still sounding un-dork-like. There’s not much I can say about Happy Holidays that you can’t see from the picture except that’s 2 coats with top and I love the deep raspberry jelly flecky-ness of it. 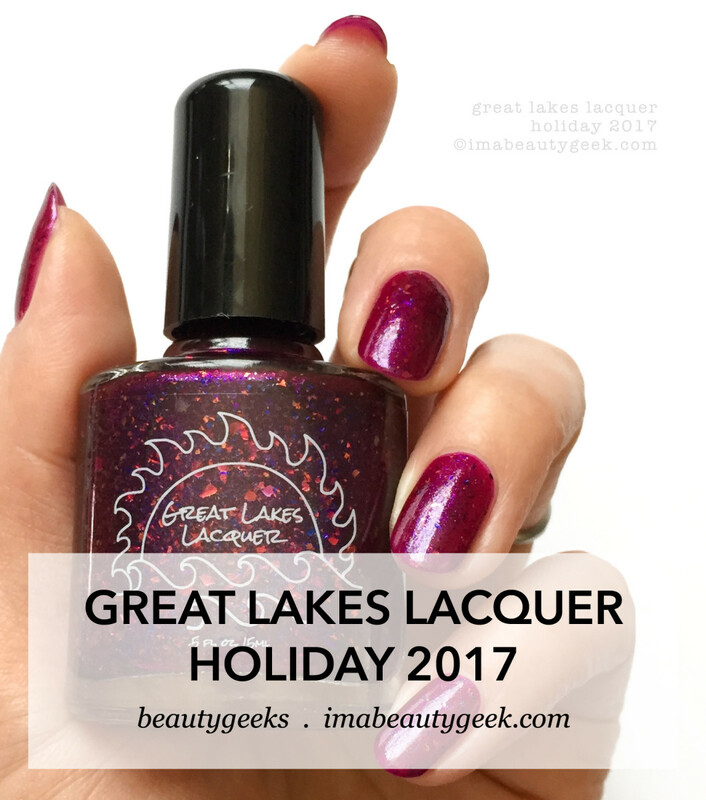 Great Lakes Lacquer Happy Holidays (above). And that’s 2 coats without top. Either way, Hello, gorgeous! So that’s what I got for GLL Holiday 2017. I’m missing a shade but that’s okay because I got to show you the magical Gift With $50 Purchase. Also, I get to show you these 2 small-batch shades before I let you go! 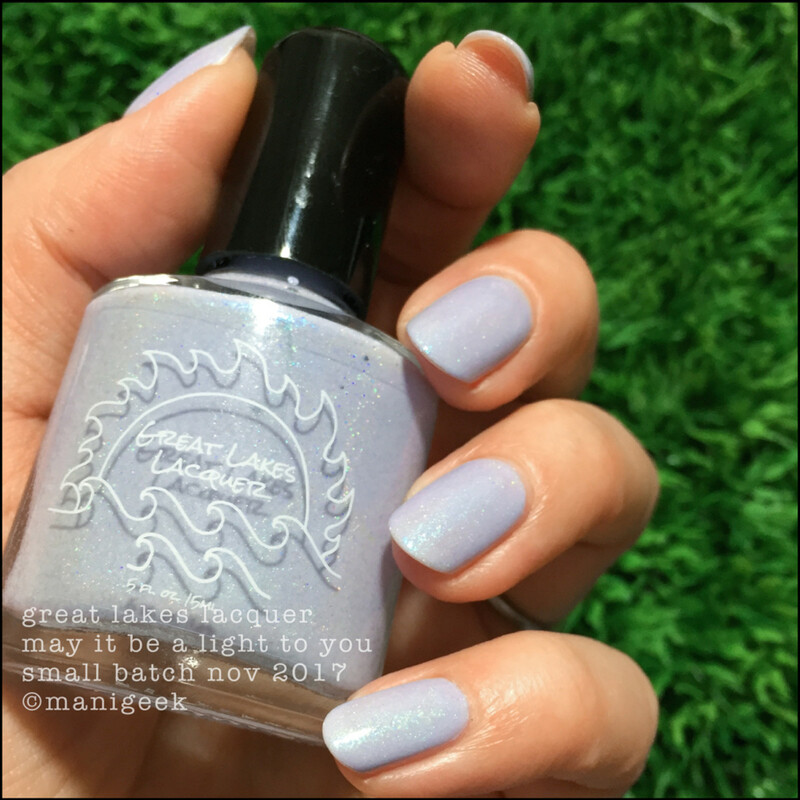 Great Lakes Lacquer May it be a Light To You – Small Batch 2017 (above & below). That’s 3 coats of this misty, über-chilled pale lilac and if you’re a fan of these kinds of shades for winter (and I totally am! ), you’re going to want to act fast because small batch means, uh.. small batch. 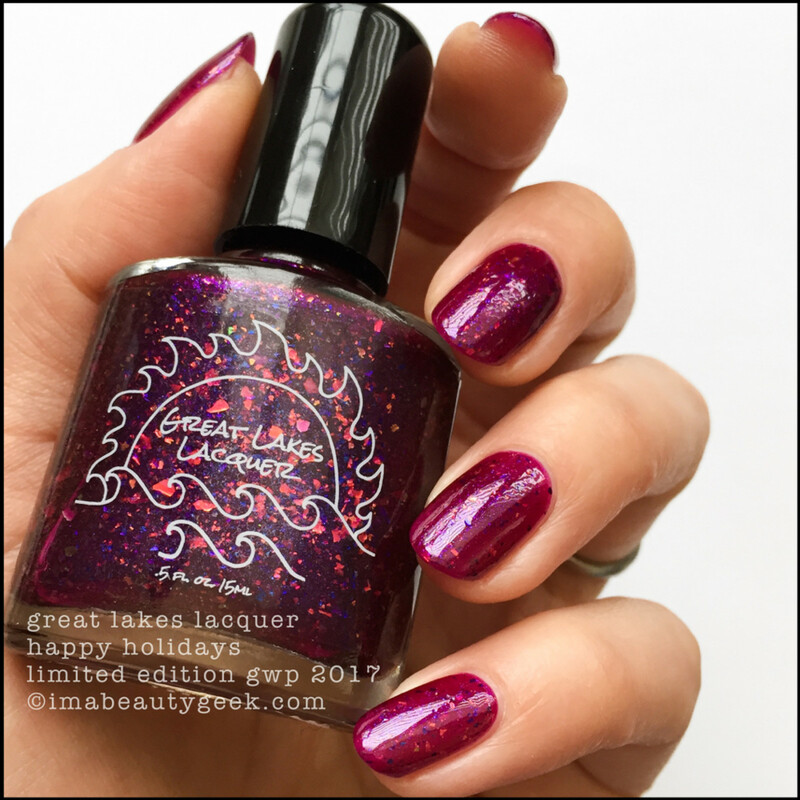 Great Lakes Lacquer One More Time Around – Small Batch 2017 (above). I don’t understand how all the things in this polish make it turn out looking like some kind of precious blurple stone. It pretty much freaks me out. Great Lakes Lacquer One More Time Around (above). I know, right? My mind is boggled. Also, #blurple. And that’s it, fellow Great Lakes lovers! And you got to have a sneaky peek before the 11pm EST launch on November 23! Hurray! What I didn’t tell you is that there are 20+ shades (including these) going up on GLL for Black Friday – I really only showed you a fraction. Scary, huh? Manicures & Photos Karen Falcon (she’s freaking out because she doesn’t think she’ll ever get through all the holiday polishes – ever). 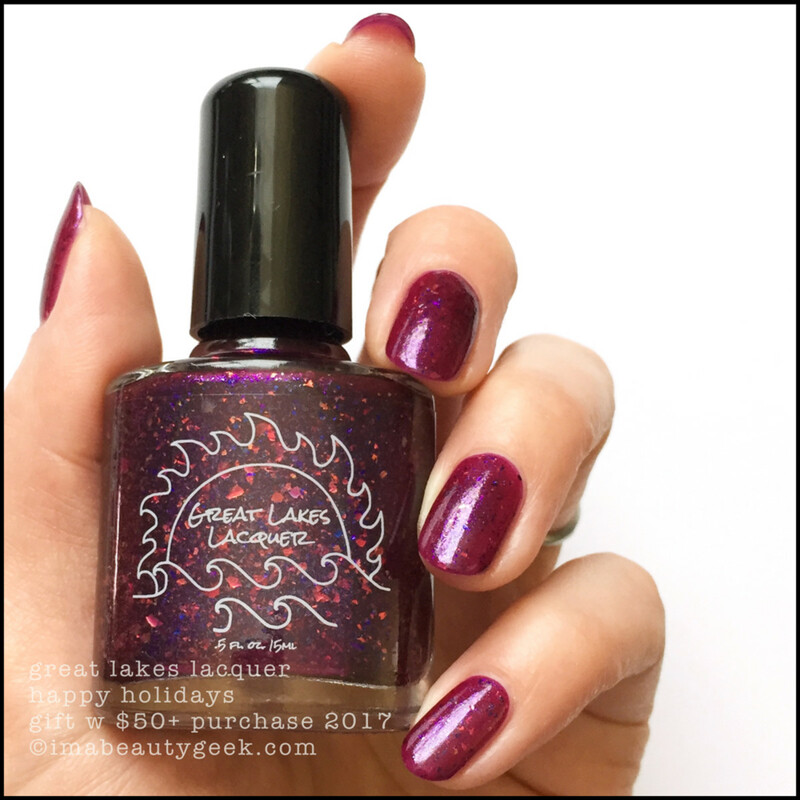 Great Lakes Lacquer: A Brand You Gotta See!